Learn fact from fiction when deciding whether cutting utility ties is your homestead’s best power option! 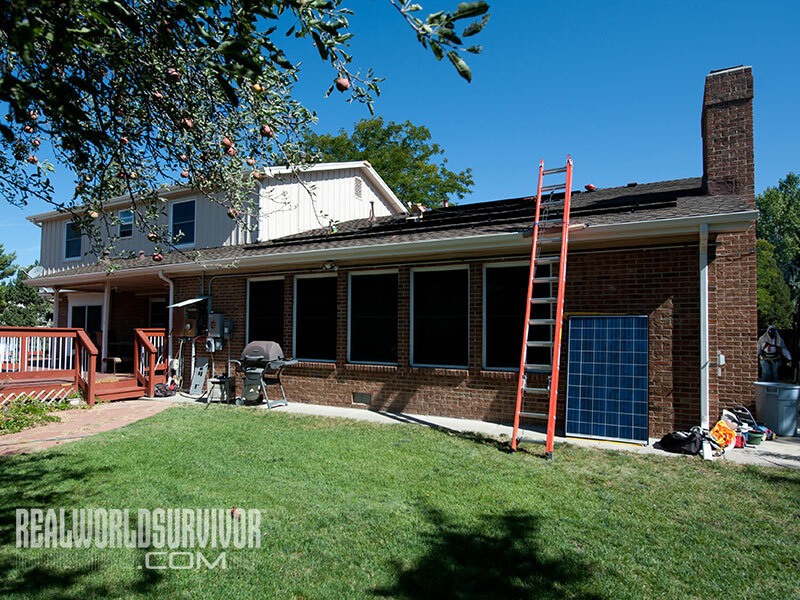 Today’s solar-electric modules are relatively inexpensive and can be made to fit almost any roof. 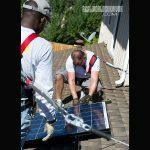 For most homeowners installing a direct-tie system and selling power back to their utility company makes more sense than going completely off-grid. 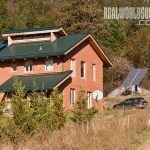 Going off grid is never easy, but the process can be made much simpler by going about it in the right way. 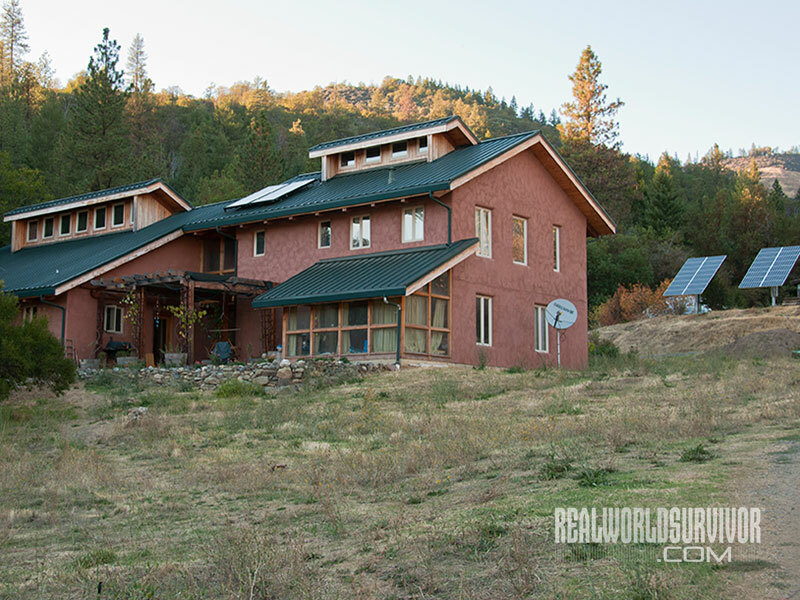 The owners of this home live in a fairly remote area, but chose to stay on-grid and sell power back to the utility, which they do during late spring and summer. Going off-grid did not pencil out for them. 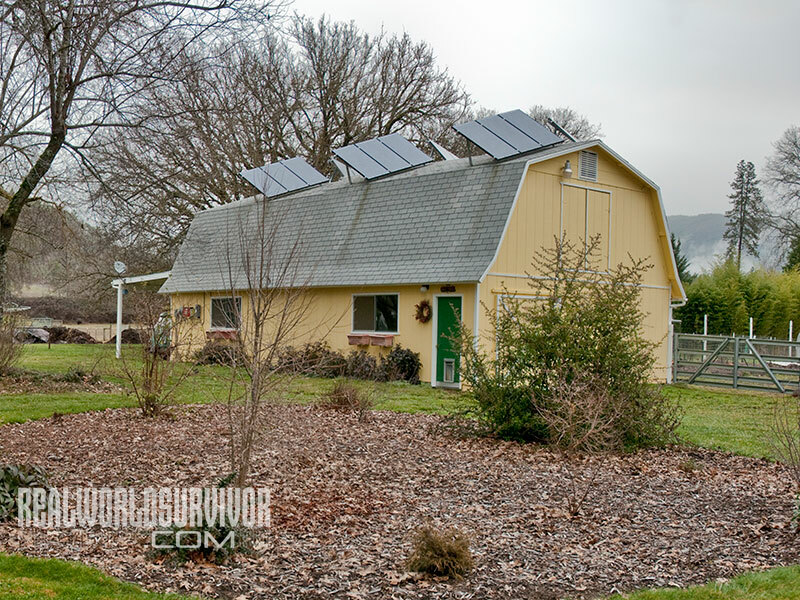 They built an energy-efficient straw bale home and heat with wood. 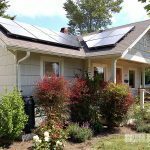 Solar-electric modules can be mounted almost anywhere there is sunshine, and all the energy they produce is absolutely free. Mounting them on a roof as shown here is not ideal, but the owners had no choice because of their site. 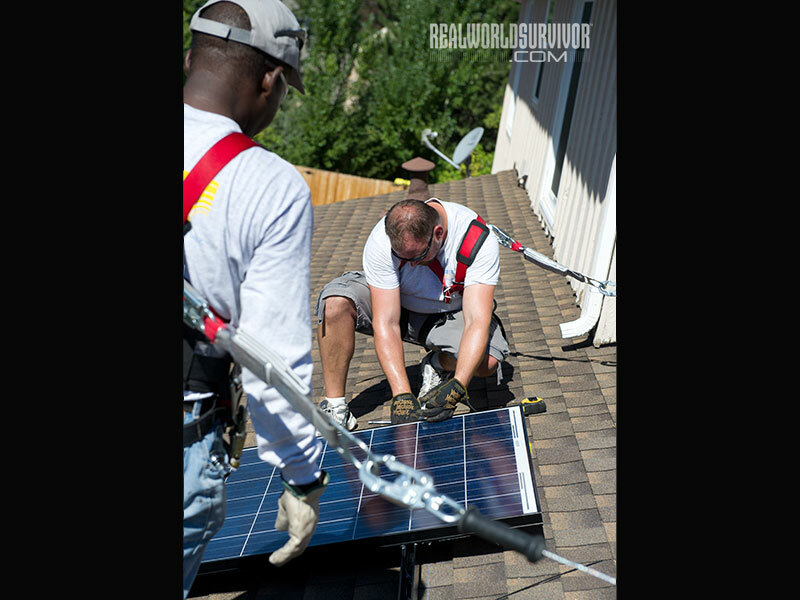 Service panels on a roof can be a risky chore. A large battery bank for a three-inverter off-grid system. 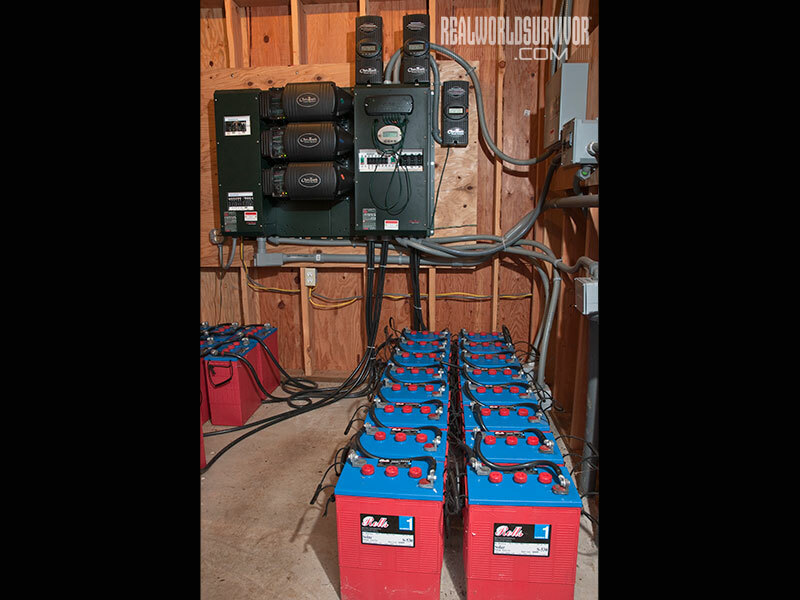 Batteries certainly make off-grid living a doable proposition. 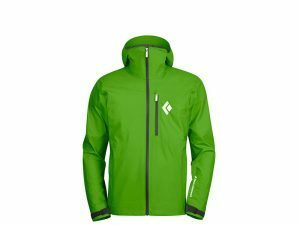 Thinking of going off-grid? A general grasp of the broad particulars of solar and wind technologies is, of course, valuable, and it will prove its worth when the time comes to start sinking hard-earned cash into a system. 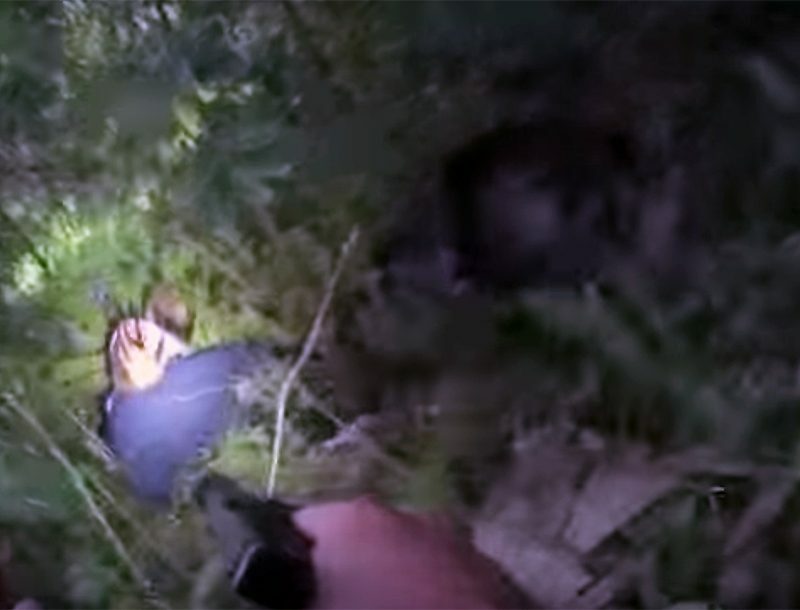 But I’ve noticed that somewhere between theory and practice there are the stray enthusiasts who get bushwhacked by some very peculiar notions concerning what is and isn’t practical, or even possible. I did, for instance, have a long email exchange with an obviously intelligent gentleman who seemed to believe (and, I suspect, still does) that by perfectly synchronizing his home’s electrical loads with his solar array’s output he would be able to build an off-grid system without batteries or any other means of storing energy during fat times for use during lean times. And although it is an idea that does in fact work fairly well with pond pumps that always draw the same load with ho-hum predictability, and even certain types of well pumps mated to sophisticated controllers, for an off-grid home it is—perhaps thankfully—a totally unworkable concept. Still, it begs an answer, since, I’ve learned, there really are a lot of people who will do almost anything to avoid having to install a battery bank in their home. And along the way, we just may be able to clear up some lingering misconceptions about how solar and wind energy systems work at a fundamental level. The most obvious reply to anyone wishing to go off-grid sans batteries is that the house would essentially shut down at night and during periods of cloudy weather. Or even when a single heavy cloud wanders between the sun and the solar array. But assuming, for whatever reasons, a person is willing to accept such onerous limitations on his system’s performance, is such a system possible? 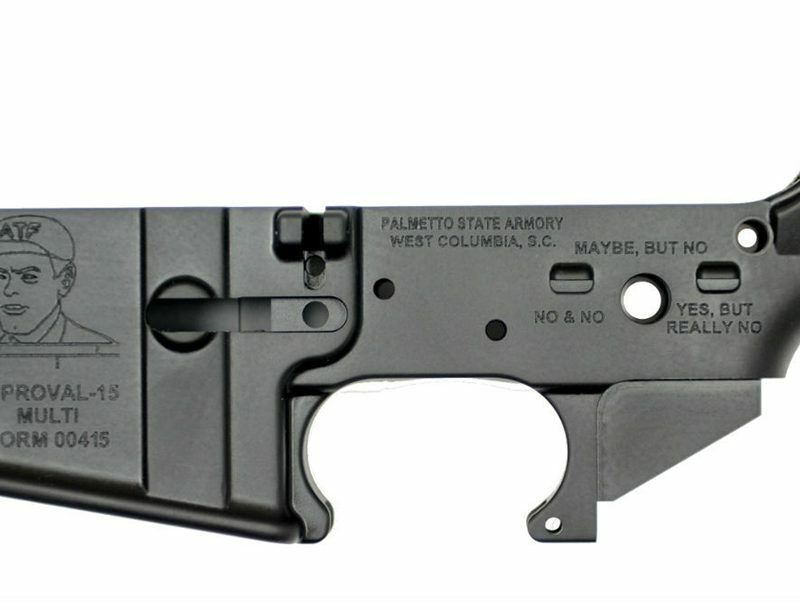 Not in any practical sense. And especially not if you plan to use standard 120-volt AC (alternating current) appliances in your home. The problem lies with the power conditioning equipment, namely the charge controller, which monitors and continually adjusts the amount of solar energy going into the batteries, and the inverter, which draws low-voltage DC (direct current, usually 12, 24 or 48 volts) from the batteries and transforms it into high-voltage (120 and/or 240 volts) AC. Both of these components are engineered to operate at a baseline level, meaning that even at night—and even if you manage to shut off every single fixture and appliance that could possibly draw a single watt of power—the charge controller and the inverter will still require a minimum amount of power: about 3 to 5 watts for the charge controller, and around 20 to 25 watts for the inverter. These components will not continually shut down and start up again at the whim of the sun. Besides, a charge controller simply will not work without a battery, and modern inverters, brimming with sophisticated electronics that are painstakingly programmed, are not designed to be incessantly turned on and off like a radio or a light bulb. Additionally, a battery-less direct-tie inverter will not solve the problem, since it is hardwired to shut down whenever the utility power grid (to which it must be wired) shuts down. Even if you could find a simple, no-frills off-grid inverter from the solar Stone Age that would, for a time, endure such mistreatment, you would still be facing another, more vexing problem regarding the nature of induction motors, such as those found in refrigerators, washers and dryers, vacuum cleaners and a legion of other household appliances. It all has to do with the fact that such motors are designed to operate within a given range of voltage, hertz (cycles per second) and amperage. If these parameters are not met, as would frequently be the case in a battery-less off-grid system, most motors will still try to run under suboptimal conditions, and will very quickly burn up for their selfless efforts. It’s a problem that cannot be remedied, even if you elect to go a further step down the ladder and forego the inverter by converting your house to run entirely on low-voltage DC, since even DC motors operate within a non-negotiable range of parameters. The moral? Battery-phobes should either seek a cure for their condition, or abandon their off-grid aspirations, at least for a year or two. 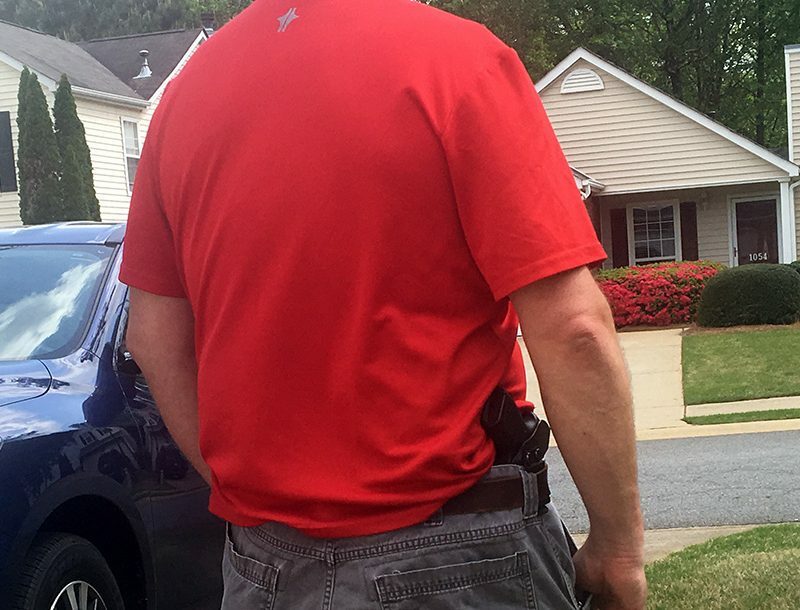 I also hear a lot from folks—all of them men, actually—who are terminally disenchanted with their electric utility and are seeking advice on the best way to untether themselves from the evil coal or nuclear generators on the other side of the hill. Some have their own ideas on how to go about it and are hoping for confirmation on the credibility of their schemes. 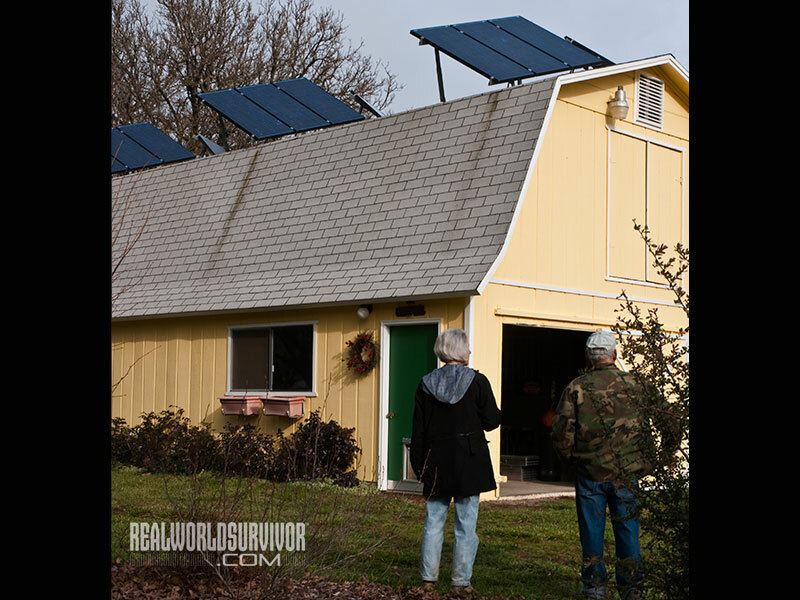 I’ve heard from some people who are so angry with their power companies that they are willing to forego the solar and wind aspects of off-grid living—presumably to avoid mystery-shrouded components whose installation and use require the ascension of a rather sharp learning curve—and instead use generators to charge banks of batteries, which would then run their homes. But unless they are rich and have no desire to remain that way, this is a very bad idea. Even a very energy-efficient home with modern appliances will use around 10 kilowatt hours (kWh) of electricity per day, which is about equal to the energy contained in 0.30 gallons of gasoline. Sounds pretty good, right? About a buck a day, give or take. The problem is, lights and toasters do not run on gasoline, they run on electricity. So before your English muffin pops up hot and begging for butter, your 0.30 gallons of gasoline must first be converted to heat (internal combustion), the heat converted to mechanical motion (a spinning crankshaft), the mechanical motion to electricity (inside the generator’s windings), the electricity to chemical energy (battery storage), and the chemical energy back into electricity (DC battery output, then converted inside the inverter into AC house current). Add up all the energy losses due to inefficiencies along the way and you’ll find that something like 90 percent of the energy in the gasoline has been lost, meaning that in reality it takes somewhere close to the chemical energy contained in 3 gallons of gasoline to supply a house with 10 kWh of electricity. 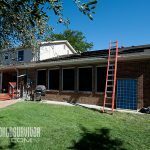 And with gas hovering at around $4 per gallon, you’re looking to spend over $350 per month for energy that could be free by investing a couple thousand dollars into solar panels and some basic equipment. 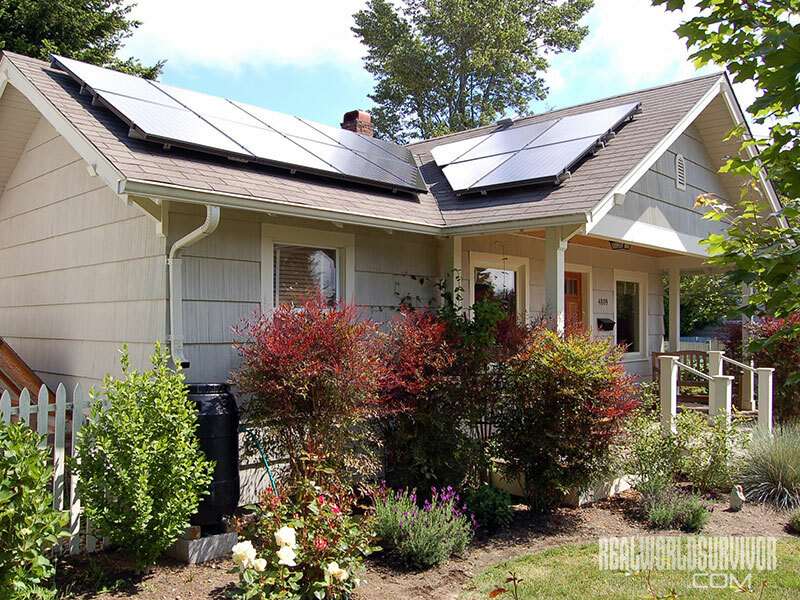 But even if you plan to go off-grid in conventional solar fashion, it still may not be the best way to go. What’s that, I can hear you say. 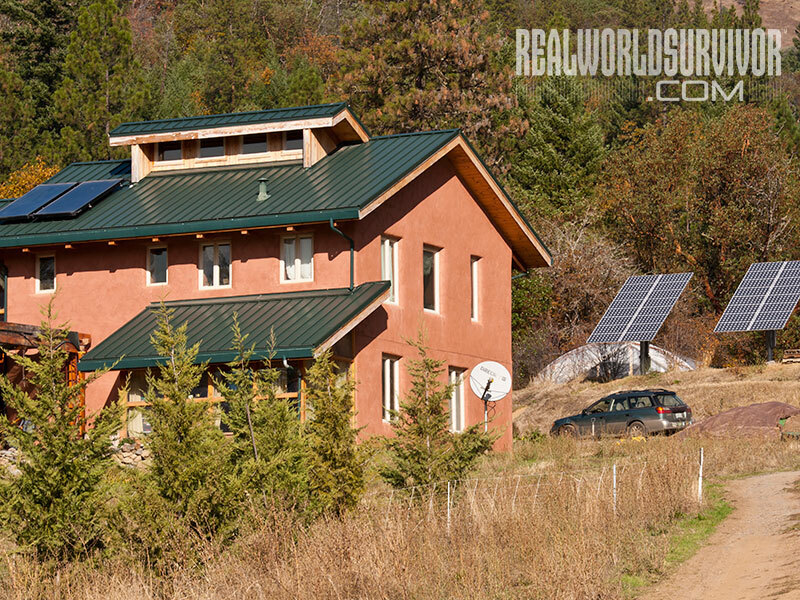 Don’t you live off the grid? Yes we do. 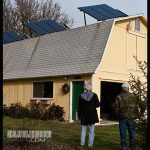 But at the time we set up our off-grid system, the nearest power pole was 2 miles down the road, a fact that greatly impacted the economics of our situation, since the cost of bringing power to our house far exceeded the cost of a deluxe off-grid system. No one currently hooked to the grid can make such an argument. With all things being equal, there is no possible way you can unhook from the grid in an economically viable way. Although solar panels are cheaper than ever—less than $0.80 per watt, last time I checked—and charge controllers and inverters are still affordable, the cost of batteries (the most ephemeral link in the energy chain) is getting higher almost by the day. And since the batteries most off-gridders use have a life expectancy of less than eight years, the value of the energy you produce will, unfortunately, never equal the cost of your system. 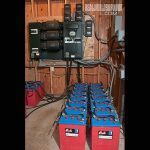 So although you may not want to hear it, my recommendation is to stay connected to the grid, then take all the money you would have spent on an off-grid system and use it to buy a large battery-less direct-tie system. After all, what better way is there to even the score than to make the utility company buy your power for the same price you’re paying for theirs?